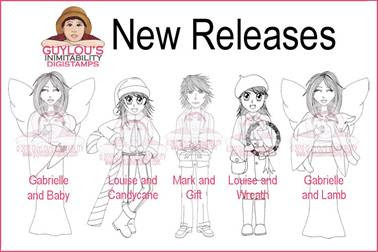 Welcome to Guylou’s Inimitability Christmas Digistamps Blog Hop. This is going to be a lot of fun!! We are kicking things off at Guylou’s Inimitability where you will start and end the blog hop and if you have come here from Brenda's blog then you’re doing great! If not, please start at Guylou’s Inimitability or refer to the blog hop list at the bottom of this post to find you way. The hop will be open today through Sunday, November 28th at 9:00pm EST. Guylou’s got some adorable new Christmas images to show you which are available NOW at Guylou’s Inimitability Online Store! What is a blog hop without a prize??? One lucky winner will be drawn at random from the comments on this blog post to receive one digistamp of her choice from Guylou’s new releases and a grand winner will be selected on Guylou’s Inimitability Blog to win all five new releases. You must comment on all the blogs participating in this blog hop in order to quality to win the grand prize. Eight designers are hopping along, each creating something amazing with Guylou’s new Christmas digistamps. I created my card with the darling digi called “Mark with a gift”. This image is perfect for birthdays as well as birthday cards. Well I did a little of both. A friend of ours his birthday is on de 23 th of december. I usually send either a card for his birthday or a Christmas card. Now I wil be sending one card with both themes. So hop along with us and leave us some love and you could end up a winner!! You next hop is to Dale! Have fun! Carmen, your Mark with a gift is adorable. I love the color scheme you went with and what a great idea to be able to use the card for both occassions. Thanks so much for sharing! What a great design! The pp are fantastic!!! Love the button in the snowflake; it pops out of the page!! Thanks for promoting my digis so beautifully! Ooh, I love all the paper you used on this. There's so much texture! You made Mark look great! Stunning, again i will say ....stunning, it really looks as if Mark is standing in a room looking through glass, love it!! You did G so proud !!! Love this! Awesome image. Great use of all the designer paper. Your coloring is perfect! Nice job! Really like the different elements that you added to this card. Great coloring...did you use pencils? It is so soft looking. Super awesome card Carmen!!! I love all the layers and the sentiment is perfect for your friend's birthday!! Im sure he'll love getting this card. Perfect card Carmen!!! I love the way you used the image!! The coloring is beautifully done. Great design on your card!! Love it, Carmen! Love all the layering and the PP's. Awesome coloring skills too! Love what you did with Mark and the Gift. All the different papers, the snowflake and love the sentiment! Carmen, I love it! I love this design with all of the layering of those delicious papers. Love the little snowflake...it's all wonderful. I love your card mark!! (ok so I have a weekness for a mark, hubby!!) how do u choose what to put together, I struggle choosing one paper let alone more!! Liking this blog hop stuff it's easier than I thought!! Carmen I LOVE your card.. You are the queen of paper layering. I love this Christmas-y mix you used and the soft coloring you did. Mark looks amazing! You did a beautiful job with the card. Thank you. 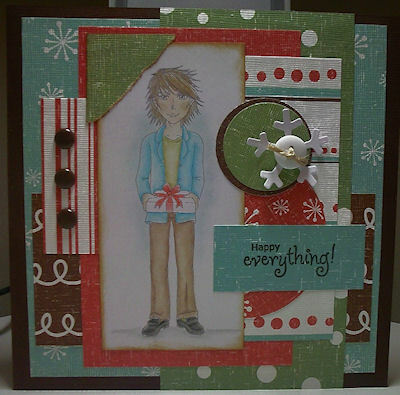 Carmen you have done a great job on this card--all the layering and your coloring is fantastic. Love that Mark with the gift. Carmen, I love the way that you layered your card. Also, I agree with you that Mark could be used for any kind of card. What a cute card! I love all the different papers used and the snowflake! Thanks for sharing! Wonderful card,love the layout! Thanks for sharing! I really like the layout of your card....fabulous combo of papers!! heel erg leuk kaartje, Car, prachtig papier en weer een geweldige sketch! So cool!! I love this image and all of your wonderful dp!! Love what you did with this card. The layout is great.